This solar charger and lamp shines bright for 14 hours, and helps those without electricity power up. Living on planet Earth means we're all responsible for it—but also that we each own sun power. 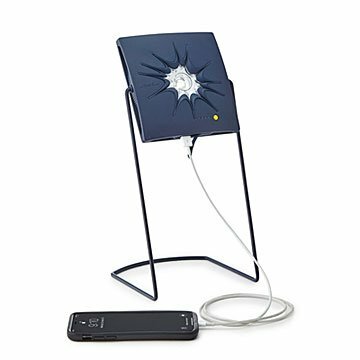 Claim your share with this high-performance solar charger and light, created by artist Olafur Eliasson and engineer Frederik Ottesen. Fully juiced, it gives 14 hours of bright light (enough for a whole kitchen or tent), 45 hours of medium, or over 150 hours of low. Use it with the stand (sold separately) to read or work, hang it to illuminate garden parties (cool design = conversation starter), or cook and charge your phone at the same time while camping. Best of all, by tapping into your share of sun juice, you're helping fellow B Corp Little Sun (Olafur and Frederik's company) offer them to villages without affordable electricity. That's what we call real power. Designed in Germany. Made in China. Nature serves as a constant source of fascination for Danish artist and engineer pair, Olafur Eliasson and Frederik Otteson. Light in particular is a favorite medium of the duo, who together founded the Little Sun project, a global initiative to bring solar lamps to the 1.1 billion people living without affordable electricity. In these impoverished communities, solar lamps allow residents to work or study once the sun goes down, therefore aiding in their economic advancement. Light is a way of connecting people, Eliasson believes. “Light is social. Light is life,” he says. Together Eliasson and Otteson use light and art to affect social and environmental change on a global level. Since launching Little Sun, they have distributed a total of 439,035 solar lamps worldwide. To charge, place the Little Sun Charge in the sun with its solar panel facing upwards or connect using a micro USB. Little Sun Charge takes about 7.5 hours to fully charge.